of exciting colors and patterns to teammates on the high school tennis team. Additionally, in the summers of high school I did odd jobs for my dad at his work. One of the mottos I like to live by in my working career is that no job is too menial or seemingly unimportant for me to do as long as I'm paid a decent wage and respected for the effort I put in. 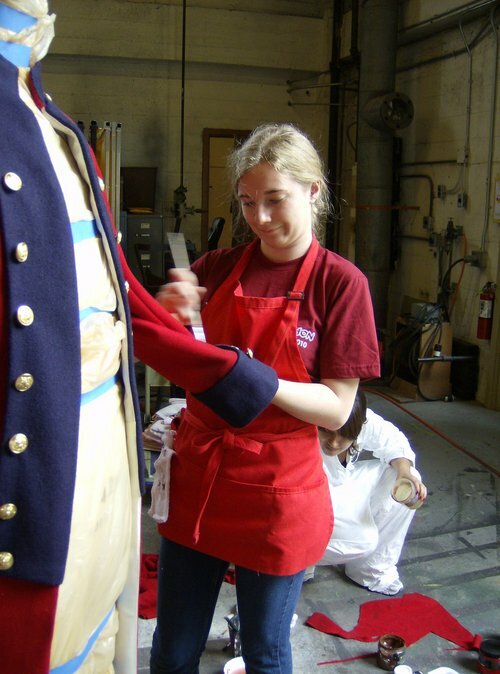 This being the case, I would consider my first real job to be my position at the Stanford Drama Department Costume shop where I have been working as a student stitcher since my freshman year of college and continue to work there today. What I mean by real job is the is the first time that I worked somewhere consistently every week for pre-set hours (about 6-10 a week) for an hourly wage. Not only this however, but this is also the first time I have ever been treated like a real employee. Working at the costume shop has been an invaluable experience in college not only because it has given me the opportunity to learn how to be a good employee but also because it has taught me what to expect out of a job and from my employers. My job has taught me how to interact with my supervisors, and how to create a fun working environment that is still productive. I feel a sense of community in my job that I want to try to create someday when I have a job. I know that my bosses care about me and value my work so I want to work hard for them and do the best I can do on every job they assign me.